Yesterday, I thanked Joe Straczynski, the creator of Babylon 5. Joe's work has been important to me, and continues to influence me. Today, I'd like to thank the late Gene Roddenberry. 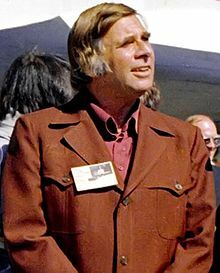 Gene Roddenberry created Star Trek. I've probably watched every episode of the show many times over the years. I consider it one of my all-time television favorites. The performances by the show's cast are a large part of the appeal of Star Trek for me, and although the special effects are poor by today's standards, they amazed me at the time. But it's not so much the show itself that means so much to me. The part that's always kept the show close to my heart was Gene's vision of the future. Many say that Roddenberry's vision is not realistic. Perhaps they're right. Perhaps if we looked 300 years into our future, we'd still see religious intolerance, racism, greed, terrorism, corruption, and all the societal ills surrounding us today. There's no way to know. I believe Roddenberry wasn't saying "This is how the future will be." I think his intent was to say "This is what the future could be like if we rise above our frailties, and here's what mankind could achieve, not just on Earth, but throughout the universe." It's that hopefulness, that vision, which appeals to me. This same kind of vision shows in Roddenberry's project The Questor Tapes, which I watched and enjoyed the first time without being aware of his involvement with it. In this movie (which was intended to be a series pilot), the Questor android was intended to guide mankind and protect it from its own self-destruction. The series presumably would have shown Questor helping to solve mankind's problems without us being aware he even existed. I'd very much like for my writing to convey a similar hope for a better future for mankind, showing a world where we've risen above our past and built a much better world for ourselves. It's in that spirit that I began worldbuilding a science-fiction universe called The Alliance of Sentient Lifeforms. I don't yet have the writing skill to bring that universe to life as I envision it, but I continue to work toward that. It's Gene's example in the original Star Trek that motivates me. I don't want to see his vision of the future die because no one in Hollywood seems to believe in it anymore. So, thank you, Gene. You've given me a science-fiction universe to enjoy on television. You've shown me a vision of the future that has enhanced and influenced my own. I appreciate what you accomplished and respect you for staying true to your vision of the future.